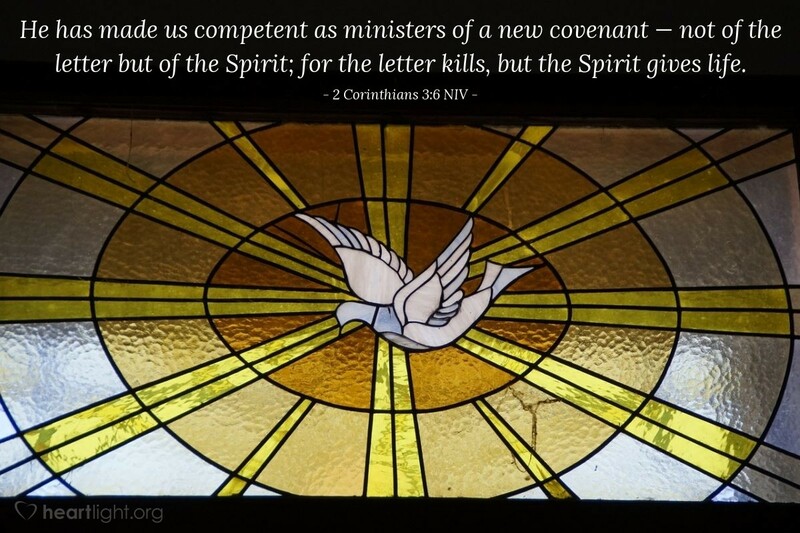 [God] has made us competent as ministers of a new covenant — not of the letter but of the Spirit; for the letter kills, but the Spirit gives life. With the coming of Jesus and the outpouring of the Spirit, God brought his promised new covenant (Jeremiah 31:31-32). This new covenant does not revolve around the giving of a law. It is "not of the letter" of the law commanding certain behaviors, but it revolves around the purifying power of the Holy Spirit to transform us. The Spirit transforms us to be more and more like Jesus. This transformation from the Holy Spirit conforms us more and more into the holy character and compassion of God himself. God wants us to understand that the focus of the Spirit is life-giving, not law-bringing. The Spirit does what no law could ever do (Romans 8:1-4; 2 Corinthians 3:18). Father God, thank you for the Holy Spirit who gives me life. Conform me to your will and transform me to be like Jesus. Form in me love, joy, peace, patience, kindness, goodness, faithfulness, gentleness, and self-control. Inspire my passion and fan into flame the gifts you have given me by the Holy Spirit — gifts given to honor you and serve your people. In Jesus' name, I ask this. Amen.